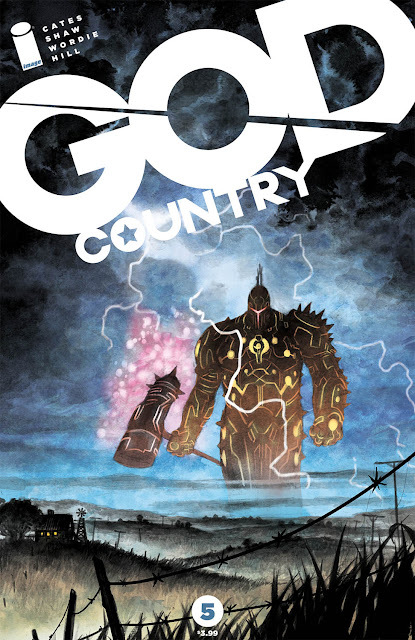 If you thought there'd be a let up on Image Comics' hot new miniseries God Country you would be sadly mistaken. Donny Cates and Geoff Shaw continue to raise the stakes and bring a giant rock opera style fantasy action masterpiece to print and issue five delivers an earth-shattering battle for the ages. After an interesting backstory on the creation of Valofax, Aristus reluctantly heads to Texas to face Emmett Quinlan and get his father's sword back once and for all. If you've been following along with this great series you'd know Emmett doesn't give a crap what the God of War wants he's keeping Valofax. The proceeding battle rattles western Texas to the core, shaking the ground, lighting the sky with electricity and filling the air with fire. It was an epic confrontation of gods, Aristus' hammer versus Emmett's Valofax, and it would become legend. Cates in his mastery injects an emotional undercurrent that elevates this fight from just two guys fighting for a sword to one trying to please his father while the other is trying to salvage the memories of his fatherhood. Aristus is much more thoughtful and sympathetic than you'd expect the God of War to be, recognizing the loss of Balegrim as another loss too many. It's a layer of character development I wasn't expecting but certainly made the battle and its aftermath that much more interesting and compelling. Emmett, meanwhile, seems consumed with power and his stubborn desire to hold on to Valofax. It's hard to blame him since the sword keeps his Alzheimer's at bay enabling him to remember his family and his departed wife. It's what fuels him to fight at any cost to hold on to his mind essentially. Cates grounds these momentous battles between giants with an emotional tether to the motivations behind the combatants. Geoff Shaw and Jason Wordie are a great one-two punch. Shaw pencils these incredible landscapes and character designs full of emotion and reaction and Wordie inserts a lifeforce full of colors that set the tone for each scene. Wordie is not afraid to flesh out the story with an eclectic mix of colors that recall works from the Jack Kirby era. There's just so much to take in that the reader's eyes can't take it in all at once. It's there to be perused and admired like the work of art that it is. 'God Country' keeps rolling along with huge moments that resonate beyond just the epic scale of battle. Cates has found the perfect formula to inspire awe-inducing events without losing its soul. It's grounded in real emotion with Shaw and Wordie handling the rock n roll visuals. To give this less than fives stars would be disingenuous, God Country has found rarefied excellence in comics.